2017 is just around the corner and most global channel executives are already working on their plans to get their channel performance to the next level in the coming fiscal year. The most experienced channel executives realize that they need to have the right strategies, tools, and programs in place before the beginning of the year to put themselves in a position to succeed. These executives understand that enabling the key people within their channel to succeed is the most critical factor in meeting and exceeding their goals. A finely tuned channel organization that is positioned to succeed is one that has motivated partners, and is supported by competent channel managers that are led by executives with insights on the real-time pulse of the business. This 2017 channel success blueprint is the easy part to define. The hard part is actually delivering a fully-enabled channel ecosystem where all parties are fully-enabled, capable, motivated, and supported to succeed. The goal of this article is to detail exactly how your channel can implement this blueprint and achieve all of your 2017 goals. 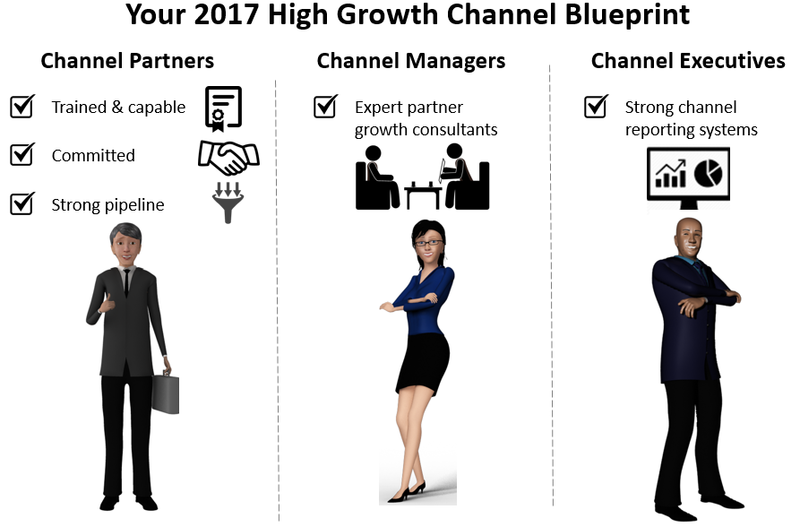 Most channel organizations have a large number of partners with a wide range of capabilities, commitment levels and revenue contributions. The challenge for channel executives is to figure out a way to build their partner’s capabilities across the board affordably and effectively. Most partner’s first priority is growing their sales and improving their profitability – not necessarily improving their technical or support capabilities. 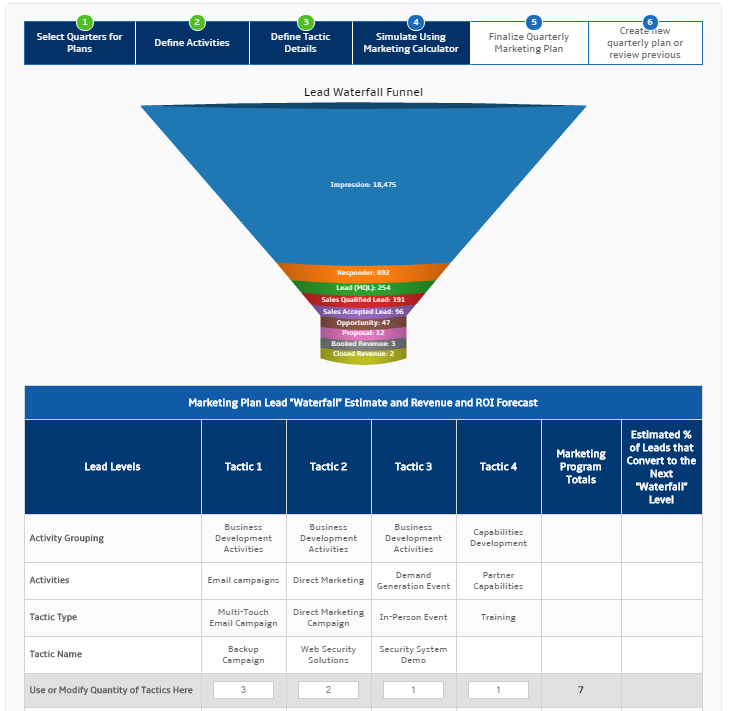 To motivate partners to invest time and energy in building their capabilities, best practice channel organizations use 3-minute partner scorecards to help them define a customized improvement plan. 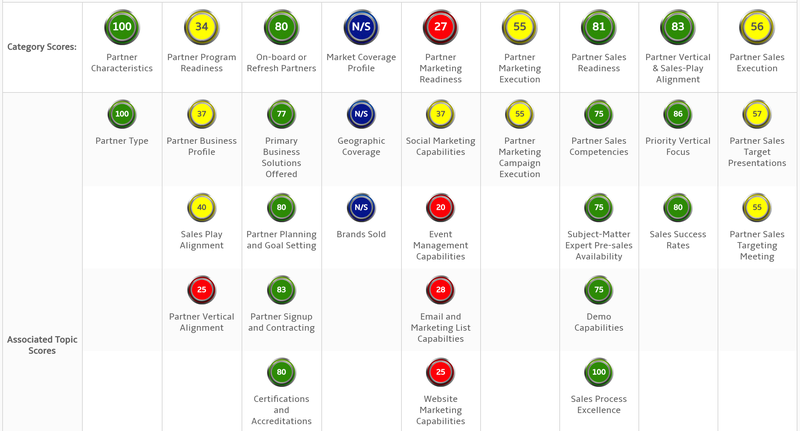 Scorecard tools like this help partners see how they stack up versus best practices on key success dimensions. These scorecards can be created with externally integrated data (i.e. Learning Management System, ERP system, etc.) and / or with a partner questionnaire that allows partners to instantly rate themselves. These scorecards can also be setup as conditional questionnaires where the same system can be configured for different partner types, different metrics by geography, or unique metrics for classes of partners. Each of these metric “categories” break down into detailed “topics” to pinpoint partner strength and improvement opportunity areas. These scorecards are used with the partner to set improvement goals and track their progress monthly, quarterly, and semi-annually in QBRs. Partners want to believe in brands that they resell or co-sell. Partner belief comes from developing a vision for success, a path to profitability and a feeling that they are well supported. The quickest way to generate partner belief is to provide them with a workflow process to build a custom plan for their business in as little as 5-10 minutes. After creating a plan for or with a partner in minutes, a partner can view and further customize a plan to further build his or her belief in your brand. 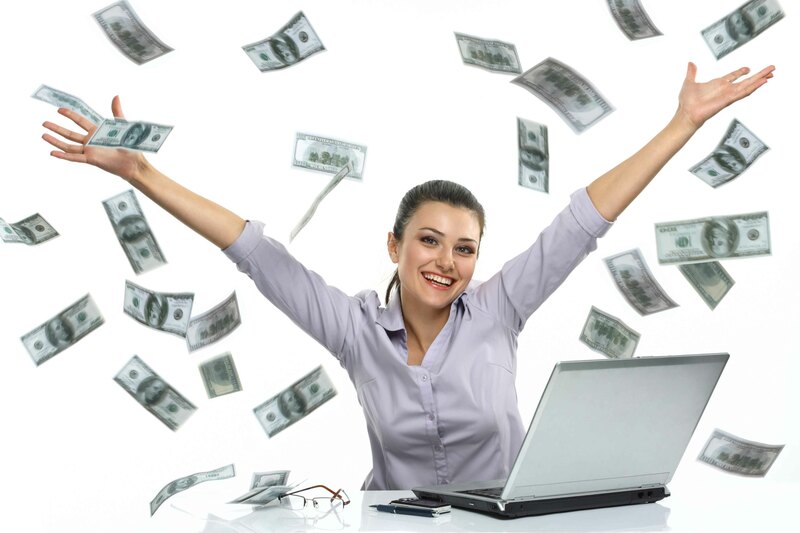 Partners that are provided this level of business planning and profitability development guidance from their vendors feel much more supported and committed to investing in growing their brand. The last leg of the stool to generate committed and motivated partners is helping them build a strong pipeline of new sales opportunities. The key is giving partner’s the confidence to lead their own demand generation processes by assisting them with key parts of the process. 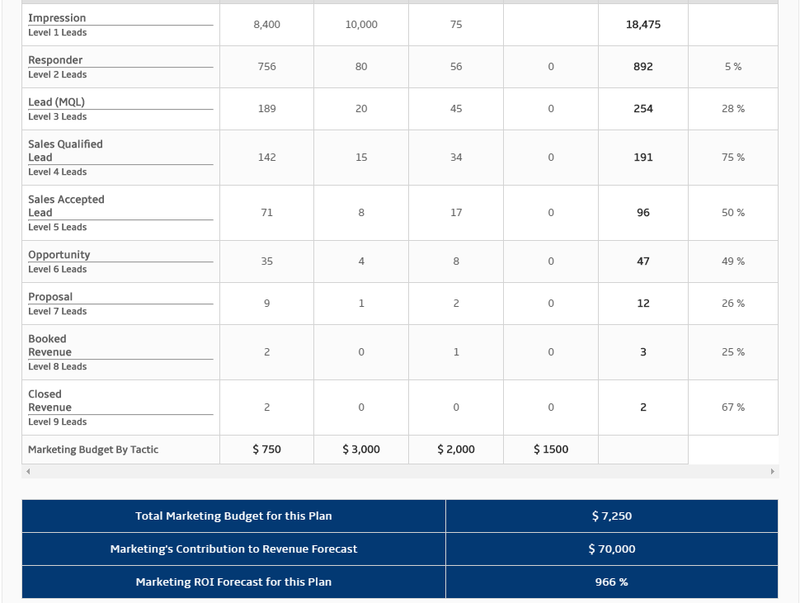 The first step is to help partners build an ROI-based marketing plan with detailed activities and tactics and a complete waterfall forecast in 3-4 minutes. Modeling tools like those below will give partners confidence in investing demand generation programs for your brand. These kind of modelling applications allow partners to define what they can expect for different marketing investment levels, while helping them make the case for acquiring market development / coop funds. With your partners armed with all of the cloud-based tools above, they are motivated, equipped, and enabled to grow. However, they are still looking for helpful and consultative advice from their CAMs to guide their business strategy and execution process. The most successful CAMs work closely with their partners using these tools to provide capabilities, profitability, and pipeline development consulting. In addition to partner enablement tools, top performing CAMs use partner management tools to offer these services at scale. 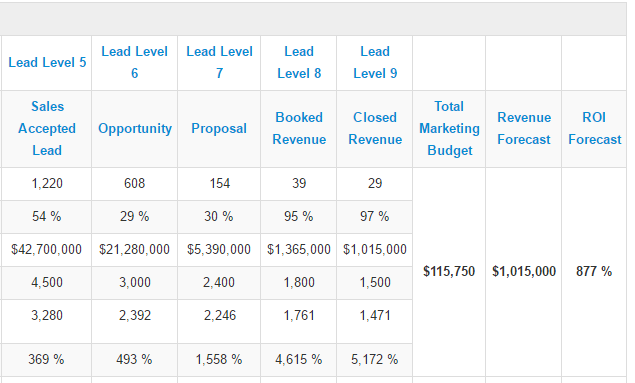 Examples of “Channel Manager Dashboards” below allow CAMs to easily access tools to consult and motivate their partners. CAMs can instantly access these key enabling tools that are uniquely setup for the key channel priorities. Partner Life-Stage Scorecards: CAMs can track key tasks that correspond with the life-stage of ta partner. This can fine tune how CAMs support each individual partner based on how they are progressing and target key improvements by stage. 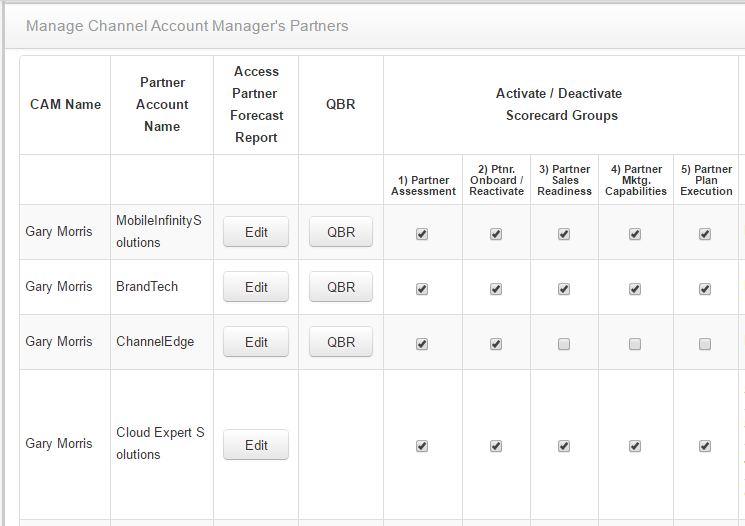 Channel systems often forget the detailed needs of the Channel Account Manager. Most large channel organizations run key CAM task areas from Excel workbooks that limit scalability, efficiency and user friendliness. As a result, these key tasks are either completed poorly or not at all. Channel systems like the above allow CAMs to get rid of low value administrative tasks and focus the majority of their time on delivering high value consultative advice and management to their partners. Channel chiefs want to have partner plans and performance-to-plans at their fingertips. They want to be able to instantly pull up reports on partner capabilities development, partner sales performance to plan and partner marketing performance to plan. Channel executive love to get instant reports across all key partners that tell them where they need to focus to improve their channel. The channel chief report below provides instant access to individual partner’s plans and performance to plan statistics to help them track and deliver QBRs. These statistics are available by partner, rolled up to CAM, region and super region. 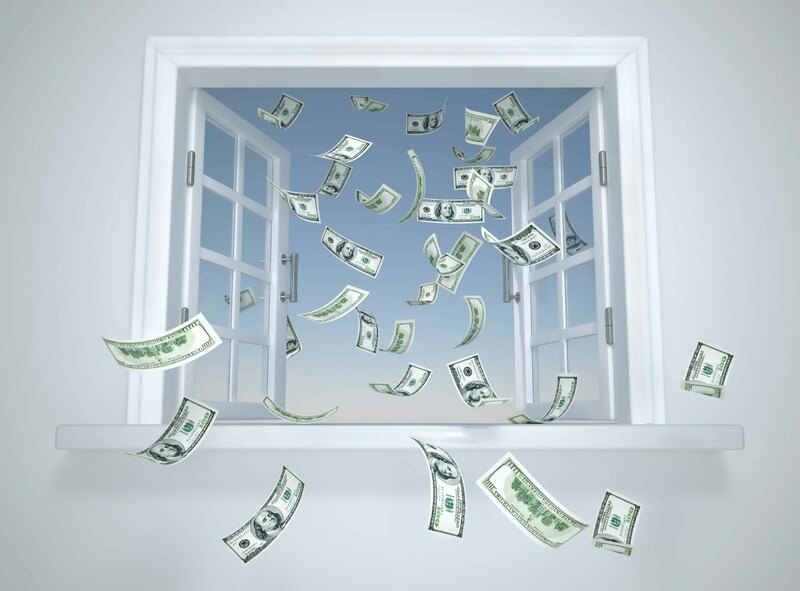 Channel executives really want to know what they are getting for what they spending in their MDF or Coop programs. The reports below help channel executives pinpoint exactly where they are getting a good return on their investment. You can execute this channel blueprint for greater success in 2017. This is achieved with enablement tools for partners, CAMs and channel executives which, when implemented, will make a significant difference in commitment levels, performance levels, and ROI. Taking care of the key people in your channel is the key to achieving your goals in 2017.